Content marketing has officially sailed past the early adopter stage. Most reputable marketing firms and experts espouse the tactic as a key component to an overall successful marketing strategy. We’ve heard since the advent of the Internet that “content is king,” and this truth has given rise to the current undeniable trend of using content to snare the attention and loyalties of a target demographic. Yet because content creation is now a legitimate marketing technique, it isn’t always taken seriously. Many companies jump on the bandwagon without a plan, without a clear brand identity, and without a commitment to quality. There is still a very prevalent assumption out there that any content is better than no content (not true), and some strategies result in an epic marketing failure. 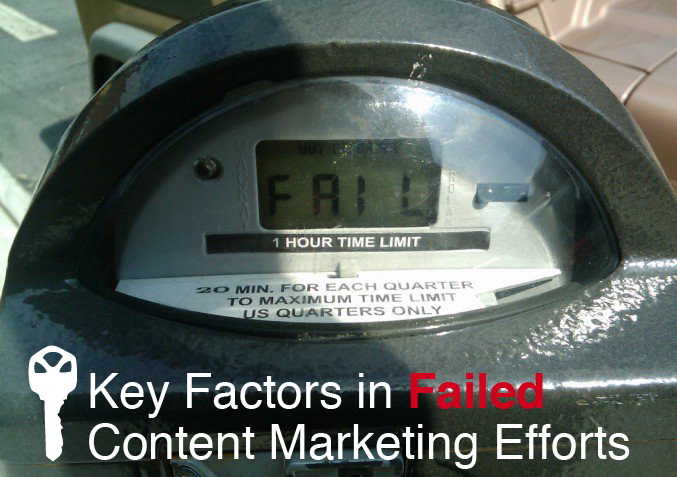 How can your company avoid the pitfalls of a poorly executed content marketing strategy? Learn from those who have faltered before you. Don’t let a sense of urgency spur you to publish content without a master plan. If content marketing is a technique that makes sense for your brand, read and absorb the most common errors below, and save yourself a tremendous amount of time, money, and frustration. Seek first what is true and of value, and then whatever happiness follows will be of the appropriate quantity and, more importantly, quality. In addition to those well-laid plans, document a host of achievable and aggressive goals. This is very commonly skipped, yet an incredibly important element. Without descriptive goals, you really have no way of accurately measuring the success or failure of your campaigns. Many marketers focus on metrics that don’t actually equate to a successful campaign. For example, if you are only tracking page views or traffic to your content, this doesn’t communicate any level of success to the company as a whole. Your goals should incorporate the company’s overall needs, whether that means an increase in profits, subscribers, or related performance indicators. Here’s where we start embracing the nuances. If you’ve already adopted lesson #1 above, that quality always trumps quantity, value is an inherent aspect to your content creation. For many marketers, value becomes the sole important factor in content marketing, and the art of promotion is sorely lacking. This is what separates mediocre content marketers from the rockstars in the space. Great content producers know how to skillfully tie in promotion and brand identity without it feeling like a hard sell. Don’t forget that blog posts and videos aren’t just to share valuable industry information, but to convert readers into actual customers or subscribers. Promotion is the name of the game, just don’t make that the only factor in the game. In order to successfully make a content marketing splash, you need to be clear on the required internal and external resources. If you have a solid marketing team with cycles to plan, execute, monitor, and adjust content strategies, fantastic, you’re ahead of the curve. For most companies, the need for outside help is a simple reality. If your core expertise isn’t in content marketing, seeking the advice or contracting the services of dedicated professionals is integral to stellar results. Never launch a content marketing campaign that isn’t skillfully integrated into your overall marketing plan. Content should be strategically synced with all other marketing initiatives, including organic SEO, PR, advertising efforts, and PPC. For example, your PPC campaigns provide insightful data about keywords, and can reveal which are have the most impact in your written content. If you are launching a large-scale PR push, content marketing should work in tandem to spread the word. These tactics should not be working independently, but instead should support each other ten-fold. Get your viewers engaged with everything you create. Ask them to comment. Appeal to their emotions, or wow them with fascinating details. Make boredom the enemy, and your potential is truly limitless.